The second day of the Service Design Network Conference was the day that the network opened its doors to the general public. Codenamed “SHARE” the day was all about … sharing in the most broadest sense of the word. This is my short reflection of the day. The day kicked off at 9.30 o’clock in a cozy Rode Hoed with +/- 200 people. At the start of the day I took the opportunity to thank everyone who made this conference possible and give a warm welcome to all the people who took the effort to show up. The audience was an interesting mix of academia and business folks. There was a lot of interest from Scandinavia for this conference. 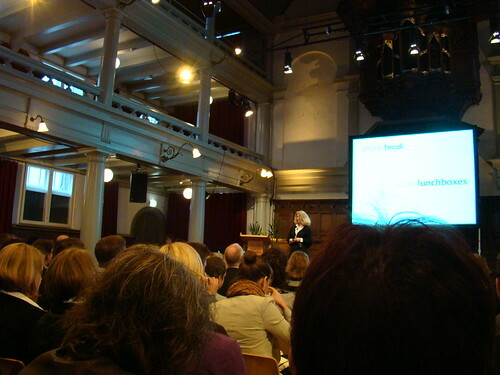 I would say that around 1/3 of the audience was Dutch and the rest was an international gathering. I’ll save you all the details and just go with my highlights of the day. As a Service Designer myself I was encouraged by the work already done by the other agencies. Maybe one of the best examples was the work done at mobilkom Austria. It wasn’t the most visually appealing presentation of the day but it showed how practical Service Design can be. People are looking for deliverables and end results of the design process. The mobilkom Austria case was the perfect example of how a company can use Service Design to achieve its strategic targets (eg. being the best Service provider in Austria). Next to mobilkom Austria, Rory and Sean from Live|work presented just what I was looking for; more real-life projects with actual clients. Oliver King who had the honor to give the final presentation of the day not only added to that with the iconic Virgin Atlantic project but he did it with his remarkable style and energy on stage. It was also good to see that there were a lot of companies in the audience. Currently it’s about people in those companies who see the value of Design and that it can be applied on more then just fancy products. But it’s still a long way to get at the crucial CxO level in companies. Service Design requires an holistic approach and you need management support for this. The IDEO presentation about metascripts made an impact. Mostly because the managed to get a message across. Where most presenters have a bunch of information they want to tell, IDEO managed to just focus on 1 thing and get that across. But in the end metascripts go into the list of creating service frameworks and platform. Like Adam Greenfield said; create beautiful seams instead of seamless solutions. The field of Service Design is quickly evolving. I have a deep respect for the true pioneers (eg. Live|Work, Sedes, Engine, ThinkPublic, etc) who actually already managed to get organizations into applying Design Thinking in order to improve their service. Although there is a lot of buzz around Design (Thinking) lately in the renowned business papers like the Harvard Business Review, Businessweek and Wall Street Journal. I’m very curious how quick this will be picked up by the people who have the authority to put it into practice. Especially with the current financial situation in the world it’s most likely management will revert to the things they know and won’t be eager to take risks with disruptive approaches they’re not familiar with. The whole Service Design industry has still a big job at its hands. Although I think we’re getting into a crucial phase. Service Design needs to prove itself as an strategic approach in many more projects. We, and the industry, needs more evidence and proof. I’m confident that it will happen but if we’ll need to see some new appealing examples next year at SDNC09!